Martin Skala, a Darien resident for over 40 years, passed away peacefully at home on Jan. 6, 2019. He was a dynamic member of the community within faith, political and social circles. Martin never met a stranger, just a future friend. Martin Skala passed away on Jan. 6. His funeral will be on Feb. 9. Martin’s love for connecting and bringing people together found a perfect focus as one of the first members of Common Ground Committee. He was an active member in many Darien community organizations including the Republican Town Committee, the Darien (Senior) Men’s Association, First Church of Christ, Scientist, where he served for 43 years in multiple volunteer capacities, including conducting services and as a board member. He was a long-time member of the New York Financial Writers’ Association. He worked for over 25 years as a communications executive with a specialty in financial writing, investor relations and corporate communications. 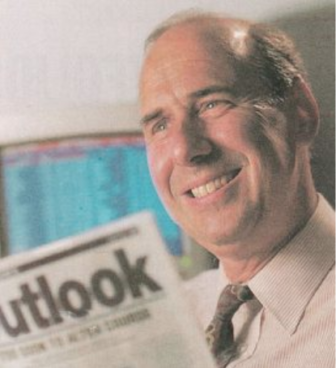 From 1979 to 1995, he was senior editor of Standard & Poor’s flagship investment advisory publication, The Outlook. Earlier, he held corporate communications positions at American Express and Manufacturers-Hanover Bank. In the 1970s, he was New York City-based business and financial correspondent for The Christian Science Monitor. Martin was an avid tennis player who loved sailing, hiking, nature, outdoor activities, and exploration. He will long be remembered for his sense of adventure. Born in Vienna, Martin came to the United States with his family as a child, settling in Sunnyside, Queens. He earned a B.A. degree from Oberlin College and an M.A. in economics from Columbia University. He is survived by his wife, Mary, of Darien; two daughters, Libby and her husband, Steve, of Brooklyn, New York; and Emily and her husband, Aaron Hull; and two granddaughters, Sophia and Talia Hull, of Norwalk. A memorial service in celebration of his life will be held at 2 p.m., Feb. 9, 2019 at Noroton Presbyterian Church, 2011 Post Road, Darien. Memorial contributions may be made to First Church of Christ, Scientist, P.O. Box 3435, Darien, CT 06820 or Common Ground Committee.